Includes one woman's wig styled in a loose finger wave. Wig is available in black, blonde, brown, dark blonde, henna red, light blonde, strawberry blonde, and white. The wig features an elastic band on the inside for comfortable one size fits most sizing. 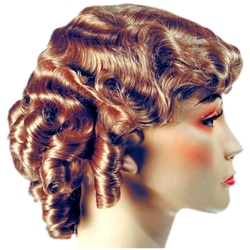 This wig is very popular for starlets from the 1930's such as Jean Harlow. The curls on the back and sides can also be brushed out to give you are big 30's fluff. This is an ideal wig for Baby Jane Hudson.